Replacing the power-packed Sanskrit words with weak, inaccurate and shakti-less (powerless) English terminology is the modern trend. In fact, there are places in the world today where the average person would even be surprised to learn that yoga itself is a Sanskrit word. This trend started with the movement of yoga practice from the East to the West in the late 19th and early 20th centuries, through pioneers such as Swami Vivekananda and Swami Yogananda. For instance, Swami Yogananda built a spiritual empire in the USA with his Self Realisation Fellowship, where his spiritual centres were known as ‘churches’ and his initiated teachers as ‘ministers’, both terms familiar to the Christian culture of the West, but completely foreign to the Eastern heritage of yoga. The trend of replacing the ancient yoga terms with English words and familiar foreign concepts continued into the 1950′s and 1960′s as Yoga Masters from India flooded the West, seeking to establish their empires. 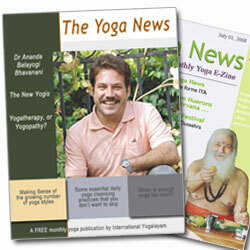 Popularity of the yoga asanas, or postures, led to the development of new names. Terms such as ’the dancer‘, ’the bow‘, ’the plough‘ and ’downward facing dog‘ were introduced into the yogic vocabulary. These English equivalents, however, miss the profound depth of meaning that are implicitly implied in their Sanskrit counterparts. Some yoga practices have also been tagged with wildly inaccurate English names. Likewise, essential yogic concepts like dharma lost true significance in its translation as the rather unattractive and dull word ’duty‘. The vitality of the idea of abhyasa was diluted to that most despised word ’discipline‘, giving the impression that this profound, life-transforming concept was something that one does not wish to do but is forced to do. The list of examples like these in yoga today is endless. In his classic tragedy, Romeo and Juliet, Shakespeare wrote, “A rose by any other name would smell as sweet.” In yoga, however, we understand that a name is a subtle, yet very real part of the thing that it is attached to; a subject that takes much study and awareness to really understand. With the loss of its Sanskrit terminology and vocabulary, the great science of yoga has been denuded of a vast part of its magnificent soul. That, in the end, is a real modern tragedy. Sanskrit – the ancient language of yoga.